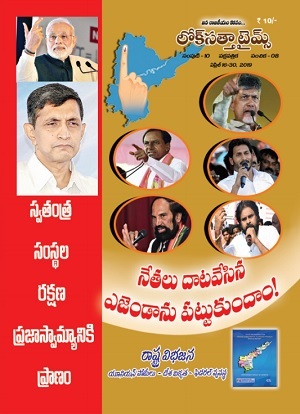 Loksatta Party national President Dr. Jayaprakash Narayan has appointed Adhoc Committees to run party affairs in Andhra Pradesh and Telangana States and expanded the party’s Greater Hyderabad unit. In a media statement issued here today, Dr. JP named Mr. D. V. V. S. Varma as President and Mr. A. S. Ramesh Reddy as General Secretary of the Andhra Pradesh unit. He has appointed Messrs YD Rama Rao, K Omkar, Beeshetti A Babji (BC), Narra Sridhar, Chennupati Vazeer, Panchadi Rambabu (BC) and Venkateswarlu (SC) as Vice Presidents, and Messrs J Iramurthy (BC), TR Jagannatha Reddy, S Janakirama Raju, Smt Sunitha Chowdary, M Siddhaiah Naidu, PV Ramana (SC) and Mohd Ismail (minority) as Secretaries. Dr. Kondiah has been appointed Chairman and D Vishnumurthy Secretary of the AP Disciplinary Committee. Its other members are Dr K. Pattabhi Ramaiah, G Janaki Rama Raju, Dr P Chandra Mouli and Dr Radha Devi. Dr. JP said that Mr. Katari Srinivasa Rao and Mr. Ravi Maruth (elected President and General Secretary of the party in united Andhra Pradesh) will be members of the National Council. Both of them will be special invitees in the Andhra Pradesh and Telangana State Committees and have full voting rights in both committees. The Andhra Pradesh State Committee will be in office until further orders or until elections are held in the State party, whichever is earlier. Adhoc Committee for Telangana State comprises the following members: Dr Bhaskar Rao P, Smt Gajanani, Gattaiah G, Smt Geetha Murthy K, Gouse Moinudin Mohd., Govinda Rao, Dr GV Rao, Jagan Kurma, Kodanda Rama Rao P, Lakshman Balaji, Smt Laxmi Datla, Dr GR Linga Murthy, Dr Panduranga Rao, Ramachandraiah V, Rama Raju LV, Rami Reddy Dr, Rammohan Rao Bandaru, Ramu Dosapati, Ravi Bollam, Ravi Kumar Jatti, Smt. Saroja Devi, Shivaji Raju, Sivaramakrishna K, Srinivas Tummanapalli and Srinivasa Reddy. Mr. P. Kodanda Rama Rao, Chairman of the Disciplinary Committee, will convene and chair the first meeting of the Telangana State Committee. The Telangana State Committee will choose its office-bearers in the first meeting and send the list to the national President for ratification. The Telangana State Committee will be in office until further orders or until elections are held, whichever is earlier. Messrs Ramu Dosapati – President, Venugopal -- General Secretary, Srinivas Gorthi, Smt Bhavani P. and Siva Rama Krishna -- Vice Presidents, Satyanarayana and Babu Anand -- Secretaries, Babu Rao (Malakpet), Devi Prasad (Maheshwaram), Dilip Shankar Reddy (Malkajgiri), Smt Hyma Praveen (Sanathnagar), Jagan Mohan Metla (Amberpet), Smt. 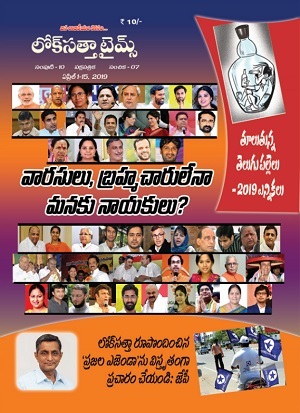 Kantimati Kannan (Nampally), Dr Lingamurthy (Medchal), Rajeswara Rao (Serilingampally), Ramachander Rao (Khairatabad), Ratnam Dasari (Cantonment), Rohit Kumar (Musheerabad), Sai Baba (Karwan), Sambi Reddy (Jubilee Hills), Sivaji Raju (Quthbullapur), Solkar Reddy (Rajendra Nagar), Srinivasan (Kukatpally), Smt Sunitha (Secunderabad), Venkatreddy (Uppal) – Members. Messrs Seshagiri Rao, Smt Saroja, Srinivasa Varma K (Malkajgiri), Srinivas Reddy (LB Nagar) and Sivaramakrishna K will be special invitees. Mr. K Sivarama Krishna of the State committee will coordinate with the GHMC committee. The GHMC unit will have its own office and bank account. It will take steps to strengthen the party and organize activities in Greater Hyderabad. 1. How can Katari & Maruth belong to two committees? 2. Is everyone in Telangana committee from Telangana only? 3. Is everyone in GHMC committee from Hyderabad only?